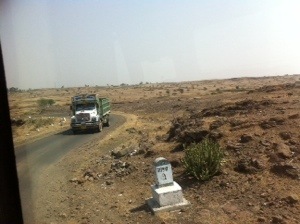 Twoandahalfweeks in India – on the way to rural villages – Go India, go future! At 4 am I leave Mumbai and go with a small travel group, organized by a foundation that has more than 30 projects running in India, to Dharawadi, about 200 km from Mumbai. In Dharawadi there is a learning and a social center. Here we will stay some days and visit from there villages, farmers and other organizations. In the pullman all get asleep. It has been a night without any possibility to go to bed. Some just arrived by plane, some Indians joined from other cities in the night. They will stay with us during the first week. One of them – just arrived at the airport – is picking me up from the hotel and together we go back to the airport, our Meeting point. We arrive around 1am and still have some hours before the group is complete. So we just sit in a park, outside the new airport building, talk about life in India and Germany, the social projects, the families, take two Chai and … It is a lot of fun. What a nice guide! Indians are generally very kind, might be because I am from abroad, maybe because I look more Indian than German or just because I have met the right people so far. the fields. Women stand up very early. Cows, goats, chicken are close to the roads, partly on the roads. Many fields, a lot of plants, sugar can , vegetables, but also many plants I do not know. In the background there are many mountains with strange forms and tops. Sunrise is fantastic. Short break at a hotel, situated in the middle of nowhere, there is a huge lake. A big water reservoir. Around eleven am we arrive. 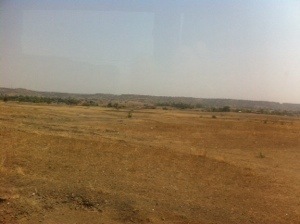 Landscape has changed during our travel. We are at about 1000 meters of altitude. There is a huge sicity.